1 In the residential municipalities of the Italian or Hungarian national community. 3 To be replaced by the euro (EUR) on 1 January 2007. Slovenia, officially the Republic of Slovenia ( Slovenian: Republika Slovenija), is a coastal Alpine country in southern Central Europe bordering Italy to the west, the Adriatic Sea to the southwest, Croatia to the south and east, Hungary to the northeast, and Austria to the north. Throughout Slovenia's history, the country has been part of the Roman Empire, the Duchy of Carantania (only Slovenia's modern northern part), the Holy Roman Empire, Austria-Hungary, the State of Slovenes, Croats and Serbs, the Kingdom of Serbs, Croats and Slovenes (renamed the Kingdom of Yugoslavia in 1929) between the World Wars, and the SFR of Yugoslavia from 1945 until gaining independence in 1991. Slovenia is a member of the European Union, the Council of Europe, NATO, and has observer status in La Francophonie. Slavic ancestors of the present-day Slovenians settled in the area in the 6th century. The Slavic Duchy of Carantania was formed in the 7th century. In 745, Carantania lost its independence, being largely subsumed into the Frankish empire. Many Slavs converted to Christianity. The Freising manuscripts, the earliest surviving written documents in a Slovenian dialect and the first ever Slavic document in Latin script, were written around 1000 AD. During the 14th century, most of Slovenia's regions passed into ownership of the Habsburgs whose lands later formed the Austro-Hungarian Empire, with Slovenians inhabiting all or most of the provinces of Carniola, Gorizia and Gradisca, and parts of the provinces of Istria, Carinthia and Styria. In 1848 a strong programme for a United Slovenia (Zedinjena Slovenija) emerged as part of the Spring of Nations movement within Austria. With the collapse of the Austro-Hungarian monarchy in 1918, Slovenians initially formed part of the State of Slovenes, Croats and Serbs, which shortly joined the Kingdom of Serbs, Croats and Slovenes, later renamed (1929) the Kingdom of Yugoslavia. 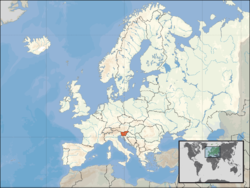 Following the re-establishment of Yugoslavia at the end of World War II, Slovenia became a part of the Socialist Federal Republic of Yugoslavia, officially declared on 29 November 1945. Present-day Slovenia was formed on 25 June 1991 upon its independence from Yugoslavia, defeating the Yugoslav Army in the Ten-Day War. Slovenia joined NATO on 29 March 2004 and the European Union on 1 May 2004. Slovenia will hold the Presidency of the Council of the European Union in the first half of 2008, being the first "new" member state to do so. The bicameral Parliament of Slovenia consists of the National Assembly (Državni zbor), and the National Council (Državni svet). The National Assembly has 90 seats, which are partially filled with directly elected representatives, and partially with proportionally elected representatives (two seats reserved for autochthonous Hungarian and Italian minorities). The National Council has 40 seats, and is made up of representatives of social, economic, professional and local interest groups. Parliamentary elections are held every four years. 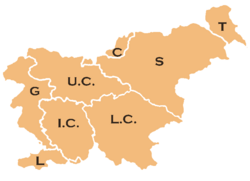 Slovenia is traditionally divided into eight regions. The last two are usually considered together as the Littoral Region (Primorska). White Carniola (Bela krajina), otherwise part of Lower Carniola, is usually considered a separate region, as are Zasavje and Posavje, with the former being a part of Upper and Lower Carniola and Styria and the latter part of Lower Carniola and Styria. According to a newer natural geographic regionalization, the country consists of four macroregions. These are the Alpine world, the Mediterranean world, the Dinaric world and the Pannonian world. Macroregions are defined according to major relief units (the Alps, the Pannonian plain, the Dinaric mountains) and climate types (continental, alpine, mediterranean). These are often quite interwoven. As of May 2005, only statistical regions exist legally, and, as their name suggests, are only used for statistical purposes. There are 12 of these regions. Map of the 12 statistical regions of Slovenia. The Government, however, is preparing a plan for new administrative regions. The number of these regions is not yet defined, but is said to be around 12 to 14. The plan will, after being publicly unveiled, need to undergo parliamentary debate. Constitution changes allowing the creation of regions have already been approved by the National Assembly. 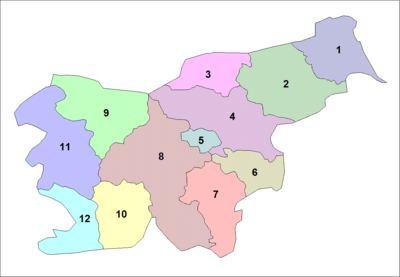 If the scenario of 12 administrative regions is selected, the regions will most likely be the same as the current Statistical regions. Slovenia is divided into 210 municipalities (občine, singular: občina), of which 11 have urban status. Four major European geographic regions meet in Slovenia: the Alps, the Dinarides, the Pannonian plain, and the Mediterranean. Slovenia's highest peak is Triglav (2,864 m; 9,396 ft); the country's average height above the sea level is 557 metres (1,827 ft). Around one half of the country (10,124 km²; 3,909 sq mi) is covered by forests; this makes Slovenia the third most forested country in Europe, after Finland and Sweden. Remnants of primeval forests are still to be found, the largest in the Kočevje area. Grassland covers 5,593 square kilometres (2,159 sq mi) of the country and fields and gardens 2,471 square kilometres (838 sq mi). There are also 363 square kilometres (140 sq mi) of orchards and 216 square kilometres (83 sq mi) of vineyards. Its climate is Submediterranean on the coast, Alpine in the mountains and continental with mild to hot summers and cold winters in the plateaus and valleys to the east. The average temperatures are -2° C (28° F) in January and 21°C (70°F) in July. The average rainfall is 1,000 millimetres (39.4 in) for the coast, up to 3,500 millimetres (138 in) for the Alps, 800 millimetres (31.5 in) for south east and 1,400 millimetres (55 in)for central Slovenia. Slovenia is a high-income economy which enjoys the highest GDP per capita ($23,250 in 2006 ) of the newly joined EU countries. The country's relatively high rate of inflation (3.6% in 2004) declined to 2.5% in 2005 and is now comparable to the average in the European Union. Slovenia's economy has started to grow more strongly in the last few years (5.0% in H1 2006, 4.0% in 2005, 4.4% in 2004), after relatively slow growth in 2003 (2.7%). Overall, the country is on a sound economic footing. During 2000, privatisations were seen in the banking, telecommunications, and public utility sectors. Restrictions on foreign investment are slowly being dismantled, and foreign direct investment (FDI) is expected to increase over the next few years. Slovenia is the economic front-runner of the countries that joined the European Union in 2004 and is the first new member to adopt the euro as the country's only currency on 1 January 2007. Moreover, Slovenia will also be the first new member state to hold the Presidency of the Council of the European Union in the first half of 2008. Slovenia's main ethnic group is Slovenians (83%). Nationalities from the former Yugoslavia ( Serbs, Croats, Bosniaks & Muslims by nationality) form 6.3% and the Hungarian, Italian and Roma minorities 0.6% of the population. Ethnic affiliation of 8.9% was either undeclared or unknown. Life expectancy in 2003 was 72.2 years for men and 80 years for women. With 99 inhabitants per square kilometre (256/sq mi), Slovenia ranks low among the European countries in population density (compare with 320/km² (829/sq mi) for the Netherlands or 195/km² (505/sq mi) for Italy). The Notranjsko-kraška region has the lowest population density while the Osrednjeslovenska region has the highest. Approximately 51% of the population lives in urban areas and 49% in rural areas. The official language is Slovenian, which is a member of the South Slavic language group. Hungarian and Italian enjoy the status of official languages in the ethnically mixed regions along the Hungarian and Italian border. By religion, Slovenians have traditionally been largely Roman Catholic. Before socialism, as much as 88% of Slovenians were Roman Catholic, while by 1991 this had already dropped to 71.6%, and the number of followers is still falling (57.8% in 2002). Slovenia's first book was printed by the Protestant reformer Primož Trubar (1508-1586). It was actually two books, Catechismus (a catechism) and Abecedarium, which was published in 1550 in Tübingen, Germany. The central part of the country, namely Carniola (which existed as a part of Austria-Hungary until the early 20th century) was ethnographically and historically well described in the book The Glory of the Duchy of Carniola (German: Die Ehre deß Herzogthums Crain, Slovenian: Slava vojvodine Kranjske), published in 1689 by baron Janez Vajkard Valvasor (1641-1693). Slovenia's two greatest writers were the poet France Prešeren (1800-1849) and writer Ivan Cankar (1876-1918). The most important Slovenian painters are Ivana Kobilca and impressionist Rihard Jakopič. The most famed Slovenian architect is Jože Plečnik who worked in Vienna as well as in Prague. Slovenia is a homeland of numerous musicians and composers, including Renaissance composer Jacobus Gallus (1550-1591), who greatly influenced Central European classical music. In the 20th century, Bojan Adamič was a renowned film music composer. Contemporary popular musicians have been Slavko Avsenik, Laibach, Vlado Kreslin, Zoran Predin, Pero Lovšin, New Swing Quartet, DJ Umek, Siddharta, Magnifico and others. Slovenian cinema has more than a century-long tradition with Karol Grossmann, Janko Ravnik, Ferdo Delak, France Štiglic, Mirko Grobler, Igor Pretnar, France Kosmač, Jože Pogačnik, Matjaž Klopčič, Jane Kavčič, Jože Gale, Boštjan Hladnik and Karpo Godina as its most established filmmakers. Contemporary film directors Janez Burger, Jan Cvitkovič, Damjan Kozole, Janez Lapajne and Maja Weiss are most notable representatives of the so-called renaissance of Slovenian cinema. Slovenia's learned men include chemist and Nobel prize laureate Friderik Pregl, physicist Jožef Stefan, philosopher Slavoj Žižek, linguist Franc Miklošič, physician Anton Marko Plenčič, mathematician Jurij Vega. Although Slovenia is a small country, there is an exceptionally wide variety of habitats. 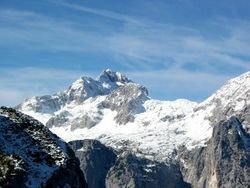 In the north of Slovenia are the Alps (namely, Julian Alps, Karavanke, Kamnik Alps), and in the south stand the Dinarides. There is also a small area of the Pannonian plain and a Littoral Region. Slovenia also contains a Karst, a very rich, often unexplored underground habitat containing diverse flora and fauna. The word karst itself derives from the Slovenian region of Kras. Half of the country (about 53%) is covered by forests. These forests are an important natural resource, but they are also valuable for the preservation of natural diversity. An ecological asset like all forests, they enrich the soil and cleanse the water and air. Slovenians find the social benefits of tourism and recreation. The forests also lend their natural beauty to the Slovenian landscape. In the interior of the country there are typical Central European forests. The predominant trees are oaks and beeches. In the mountains spruce, fir, and pine are more common. The tree-line is at 1,700 to 1,800 metres (or 5,575 to 5,900 feet). Pinetrees also grow on the Karst plateau. Only one third of Kras (Karst) is now covered by pine forest. It is said that most of the forest was chopped down long ago to provide the wooden pylons on which the city of Venice now stands. The Karst and White Carniola are well known for the mysterious proteus. The lime/linden tree, also common in Slovenian forests, is a national symbol. A national proverb says, "A true Slovenian must raise a child, write a book and plant a tree." In the Alps there are flowers of great beauty such as Daphne blagayana, various gentians ( Gentiana clusii, Gentiana froelichi), Primula auricula, Edelweiss (the symbol of Slovenian mountaineering), Cypripedium calceolus, Fritillaria meleagris (Snakes's head), and Pulsatilla grandis. Fauna includes marmots (introduced), steinbocks, and chamois. There are numerous deer, roe deer, boars, and hares. The loir or fat dormouse is often found in the Slovenian beech forests. Hunting these animals is a long tradition and is well described in the book The Glory of the Duchy of Carniola (Slava vojvodine Kranjske) (1689), written by Janez Vajkard Valvasor (1641-1693). Some important carnivores include the Eurasian lynx (reintroduced to the Kočevje area in 1973), European wild cats, foxes (especially the red fox), and the rare jackal . There also exist hedgehogs, martens, and snakes such as vipers and grass snakes. As of March 2005, Slovenia also has a limited population of wolves and about 400 brown bears. There is a wide variety of birds, such as the tawny owl, the long-eared owl, the Eagle Owl, hawks, and Short-toed Eagles. Various other birds of prey have been recorded, as well as a growing number of ravens, crows and magpies migrating into Ljubljana and Maribor where they thrive. Other birds include (both black and green) woodpeckers and the white stork which nests in Prekmurje. The indigenous Slovenian fish is the Marmorata. Extensive breeding programs have been introduced to repopulate the Marmorata into lakes and streams invaded by non-indigenous species of trout. The only regular species of cetaceans found in the northern Adriatic sea is the Bottlenose Dolphin (Tursiops truncatus) . Domestic animals originating in Slovenia include the Carniolan honeybee, the indigenous Karst Sheepdog and the Lipizzan horse. The exploration of various cave systems has yielded discoveries of many cave-dwelling insects and other organisms. Slovenia is a veritable cornucopia of forest, cavern and mountain-dwelling wildlife. Many species that are endangered or can no longer be found in other parts of Europe can still be found here. modified programmes and programmes in ethnically and linguistically mixed areas.